If you’re one of those people who’s found themselves down a YouTube wormhole, watching video compilations of cute children with dogs, then you’ll be pleased to know the real life version of those videos happens as part of GSBTB Open Art Shelter’s weekly outings. Informally called “Open Dog Shelter”, it’s a therapeutic approach to fun and community-building, bringing children together with dogs. Abeera Atif met up with the forerunners of this sub-project, namely Vanessa and Ania, who have been long-standing volunteers with GSBTB Open Art Shelter. In this interview, they share cute anecdotes, stories of coming together and growth, as well as how to get your dog involved in the project. Ania (pictured left) and Vanessa (pictured right). Source: Abeera Atif. What brought you to Berlin, and how are you finding it compared to where you are from originally? Vanessa: It may be a little different for me, because I always knew I was just coming for a year. I come from Vermont in the US, and we were coming because my husband is a journalist and is doing a project on family history. Before I left the states, I was Googling for volunteering opportunities because I knew I wouldn’t be able to work – I’m a nurse in the States and I wouldn’t have my license here. 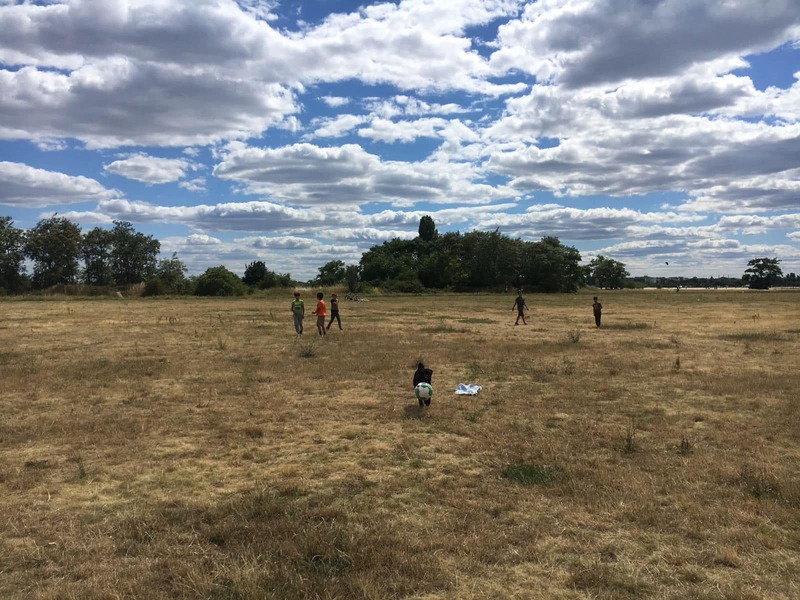 GSBTB came up, particularly the Open Art Shelter – and as it turns out, where we were living is very close to Tempelhof, so it worked out perfectly for me. Obviously, Vermont is a very rural area, and now we’re more smack-dab in the middle of a city – but we’ve loved it. Berlin’s been great because you walk out the door and everything’s right there. In Vermont, you have to get in a car to go out – but people are people everywhere. Ania: I come from Łódź in Poland, but I’ve been living abroad for a long time. I spent a few years in China, England and Switzerland. Immediately before coming here I was in Switzerland for 3 years and I really wanted to leave – I wasn’t really happy there, I had difficulty making friends, didn’t have a community and was travelling constantly with my job – so I was pretty fed up. I was looking for a place that was friendly, and I just felt that Berlin had a really nice vibe, with a lot of young people trying to figure out what they were doing with their lives – something I can really sympathise with. So I moved to Berlin first, looking for something to do because I also wanted to change my life professionally – I was previously doing a PhD, and all my life I felt like I needed to stay in academia and become a professor, which hasn’t really worked out so far. I felt like I couldn’t work alone, and the isolation in academic work is really not for me. I just wanted to get out there and do more work with people, which I’m usually better at. Part of my reason for moving to Berlin was particularly that I wanted to get more involved with the refugee community here, and as a European I felt an obligation to participate. Vanessa: I will add to that – as an American, I feel like we have done such a poor job with the refugee situation right now. I feel fortunate that we had this opportunity in Berlin for a year. I’ve lived abroad many times too and really feel more simpatico with the international spirit in Berlin. Kids interacting with dogs. Source: Private. Could you tell me more about the project where you bring dogs to the Open Art Shelter outings? Vanessa: I guess I would say it goes back to when I first came to GSBTB – there was another volunteer (Tusia – who is back in Canada now), who had her own dog, did dog-sitting and was a dog-walker. Lots of times there would be requests from the kids to see the dogs, so Tusia would appear first with two dogs, then next time with five dogs, big dogs or small dogs. There’s this really wonderful story where she would dog-sit for this big husky, because one of the boys liked the bigger dogs she brought. His name was Puschkin. Tusia had to go back to Canada around the beginning of the year, and we didn’t see Puschkin for a bit. Then a couple of weeks later Ania saw the dog while walking on the street and thought, “oh! That’s Puschkin!”, and went up to the owner and asked her, “Is that Puschkin? He used to come to the dog park in Tempelhof and play with these kids”. The owner then said yes, and that she’d still be interested in meeting the kids. So then there was this marvellous reunion with this one boy and this dog, even though the volunteer who had been the dog walker wasn’t there anymore, which was really lovely. A portrait of Puschkin. Source: Private. I’m a dog person, I have a dog at home and I can totally relate to the children being so excited about them. There’s a song which has a line that says, ‘If you smile at me, I will understand, because it’s something everybody everywhere does in the same language’ – I feel that dogs are similar to a smile. They transcend the language barrier, so it’s just that unconditional love, and I think we really witnessed that with the boys in a lot of ways. 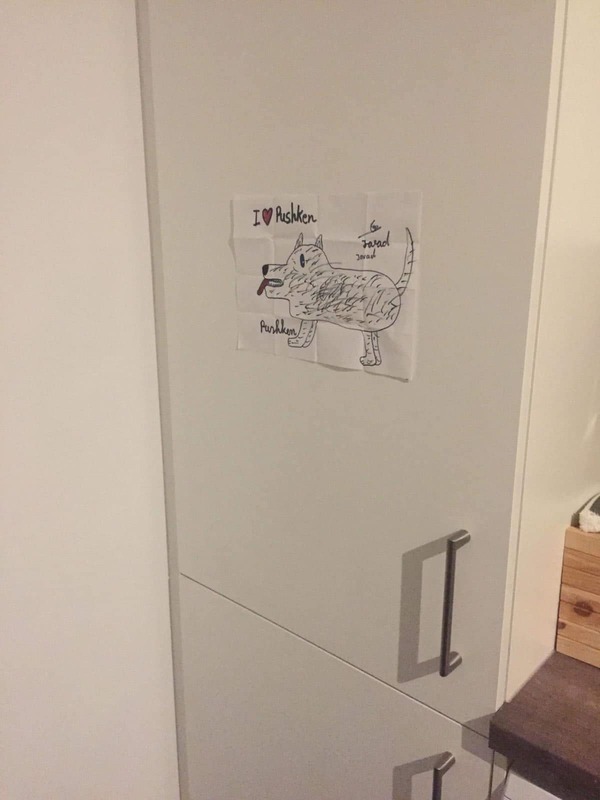 To get back to this dog Puschkin, the little boy I mentioned before loved him so much he drew a picture of him and gave it to Ania as a present for the owner – and the next thing we know the owner’s put it on her refrigerator. Portrait of Puschkin on the owner’s refrigerator. Source: Private. Ania: She even sent us a picture of the dog sitting underneath his portrait. Vanessa: I think [the owner] is just as moved by it all. 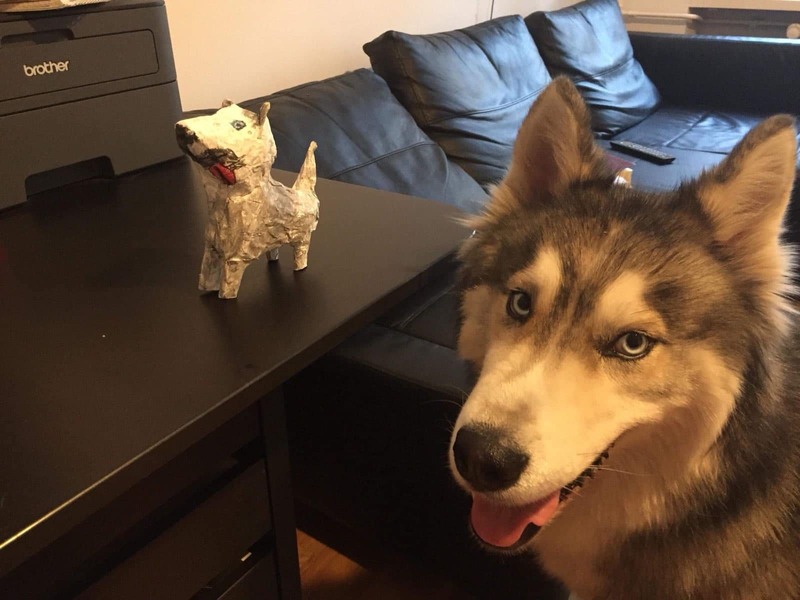 Ania: [The boy] even did an art project, and made a papier-mâché model of the husky in his art classes at school. He gave it to Puschkin’s owner – so there was a lot of Puschkin-related artwork going around. Puschkin posing with his papier-mâché lookalike. Source: Private. 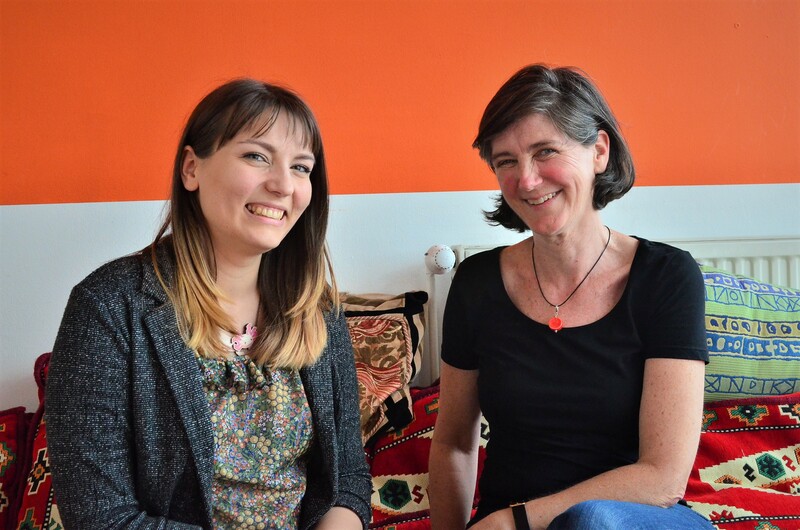 Vanessa: Recently the owner of Puschkin was going back to her home country, so Puschkin was away for six months. There was a whole ‘having to say goodbye’ moment, which I think was a really lovely skill for the boy to learn. I think once Puschkin comes back it’ll be an amazing reunion, full of joy and love. How did the project begin? Were you two the forerunners of the whole thing? Ania: It started very organically – I joined GSBTB a year ago, during the summer. At that time, the families who were involved were still living in the former Tempelhof airport. GSBTB Open Art Shelter was taking the kids out every Monday afternoon to the park, or to have a picnic, or to go to a playground and just run around. One of the volunteers was Tusia, who had a tiny pug called Kermit – he’s a very important character for everybody in the community now. She was bringing the dogs she was taking care of to these outings. In the beginning the kids were a little skeptical, some of them were even afraid; but then we figured that it would be a good idea to keep bringing the dogs. Slowly, everybody warmed up to them – everybody started loving Kermit, especially. So now even though Tusia’s been gone for half a year, everyone keeps asking about him. I went to visit a family who brought kids to these outings, and the first question from all the boys was “Is Kermit going to be there?” He’s basically a synonym for a dog for them, and also for a pug – every time anybody sees the pug they go, “Kermit, Kermit!”, although they couldn’t pronounce his name so they actually started calling him “Kummi”. Every pug is called “Kummi” now. Kids playing with a visiting dog. Source: Private. People coming from the countries that these kids are from don’t usually tend to keep dogs as pets. Did you notice any reluctance in the kids towards the dogs in the beginning? And if so, how did they overcome that? Ania: I think in every case, we had this. 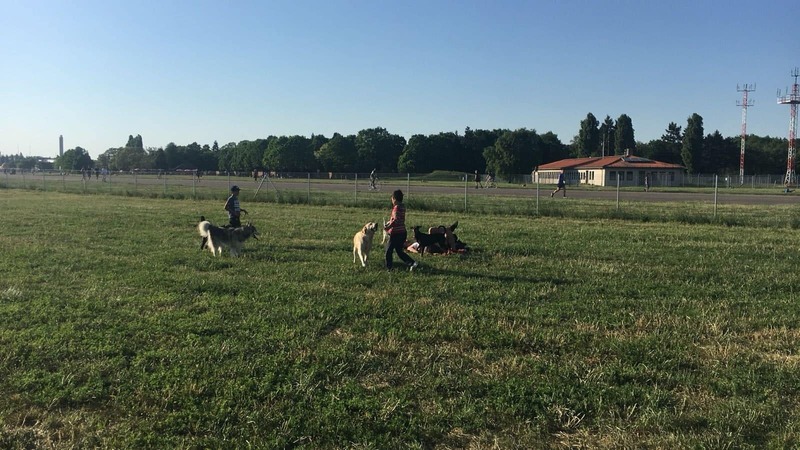 Not only in the kids, but also the parents – they were much more skeptical in the beginning, but then they saw that the kids were very happy to interact with the dogs. We tried to mostly take small dogs, which aren’t scary for most people. Now we try to have two levels: so for the ‘beginner’ kids, we have the small dogs, and then for the more ‘advanced’ kids – like this boy who’s friends with the husky – we bring the bigger dogs. [With this boy] we even go to the dog park, so he can make friends and play with other dogs at the same time. So yeah, I have seen that with all the kids – definitely overcoming fear of the unknown, or feeling a sense of unfamiliarity, or even working through a lot of their own emotions while interacting with the dogs. But it’s also good for them to adjust – because there’s so many dogs in the streets and in the parks, sometimes running without a leash – it’s also important for them to learn that there’s nothing to be afraid of, that these dogs aren’t going to attack them. I think this is definitely something they have learned to a huge degree. I’ve sometimes seen this transformation in one day – at the beginning these kids are climbing on me, they want me to pick them up because they’re afraid of the dogs running around. But after an hour or two, they keep grabbing the dogs and playing with them. At the end of the day, they never want to leave and they’re always like, “no, my dog!” For some kids it happens very quickly, and for others it happens over a few weeks or months. But every time we tell them, “we have dogs today!” the kids are really excited and happy. Even if some of them are a bit cautious and stay further away from the dogs than others, they still want to come and meet them. One of the boys playing with dogs. Source: Private. How have you seen their relationship with the dogs grow? Vanessa: The first step is always, “can I hold the leash?”, and then there’s “can I walk them?” There’s a lot of, “it’s my turn, I want to hold the dog, “no, I want that dog, you’ve had that dog the whole time”. 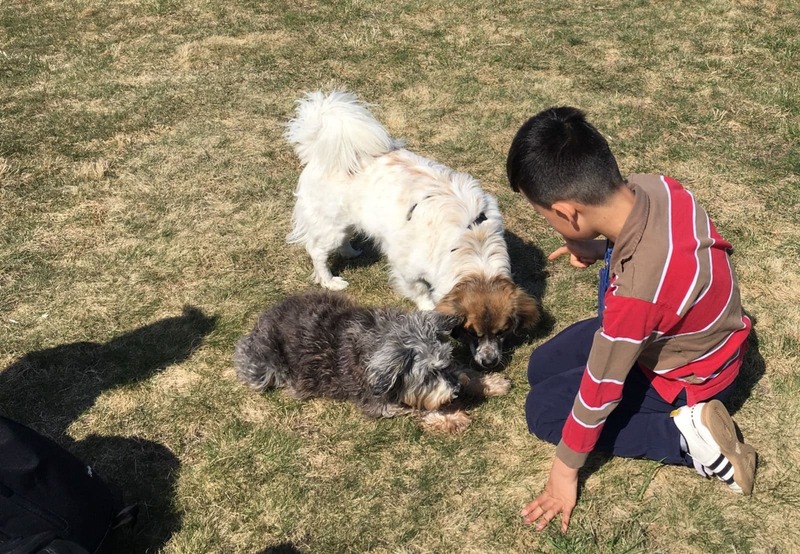 And then when we would move to a park where the dogs could be off the leash, the next step was, “can I feed the dog?” Some children were definitely more cautious – they would throw the treat, or try to feed the dog but then pull away. To see them successfully navigate that and be able to give a treat to a dog without pulling away is really something – then seeing them get more comfortable and petting them. Dogs are everywhere in Berlin, and we’ve witnessed the kids light up at a stranger when they see a cute dog. Then if the stranger acknowledges them, there’s a moment of, “is it okay to pet them?” I think that’s just another way that dogs help bridge and create different relationships – with the city and with other people. Anja: (The kids) have actually made friends with many people through the dogs – for example, with dog owners. Even if they cannot communicate very well with them, they develop relationships with these people. They always want to know the dog’s story – so where the dog and the owner come from, how long they’ve been in Germany, how long they’ve been together. Kids taking the dogs on a walk. Source: Private. Vanessa: There’s also been instances of dogs ‘knowing languages’, where several of them know commands in different languages, which is always fun. Ania: There was a dog that ‘speaks Italian’, because the owner was Italian. The kids then had to learn the commands in Italian. I think all of them know the basic commands in German and English at least, and some in different languages. Vanessa: For me this really resonated, because my neighbors in Vermont are Russian and Dutch, and sometimes our kids would dog-sit and feed the dogs when the neighbors were away. They had to learn how to say a command for the dog in Dutch, so this ‘international language’ of sorts felt like home to me. Ania: One more amazing thing that the kids have learned with the dogs is to empathize more, because of course you have to know the dog’s mood, whether it wants to play or not, whether it’s tired and wants to take a break. The dog owners and we are trying to teach this to the kids, to respect what the dog wants to do. I think the kids have been doing very well with that. Some of the more experienced kids naturally take on the role of explaining to the newer ones how they should act around the dog, not pull on its tail, or let the dog rest, or give it water when it’s thirsty. How do you ‘recruit’ the dogs you bring over to meet the kids? Vanessa: I think Ania carried that on and has ‘interviewed’ a lot of dogs (laughs). So a bunch of times we’ll get a video saying “this is the new dog we’ll be bringing”. People mainly get in touch with GSBTB, and then Ania meets with the owners and their dogs. Ania: We’ve been trying to recruit new volunteers for the project, actually, as since Tusia left we don’t have dogs coming over as regularly. Sometimes I invite my friends with dogs to come, but we are looking for people who can get involved on a more regular basis. We’ve put up this ad on the GSBTB website saying that we’re looking for volunteers with dogs, and when people send applications, I meet with them, talk about our project and what they could do. They usually send photos and videos of their dogs, because the kids are always asking what type of dogs are coming, what colour, how big, how old? They have lots and lots of questions. 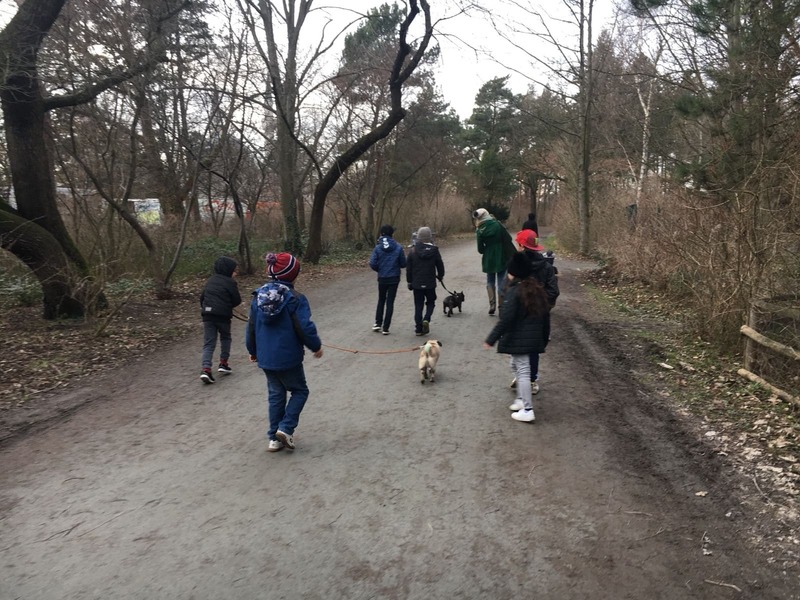 We mostly want to keep going because the kids keep asking for dogs – “when are we meeting the dogs?”, “how can we meet them when Tusia isn’t here?” and, “when is Kummi coming back?” These questions came up from all the kids, from the oldest to the youngest. The one boy who is friends with Puschkin is just in love with all animals, but especially dogs – we really wanted to help him develop this interest and his emotions for them. 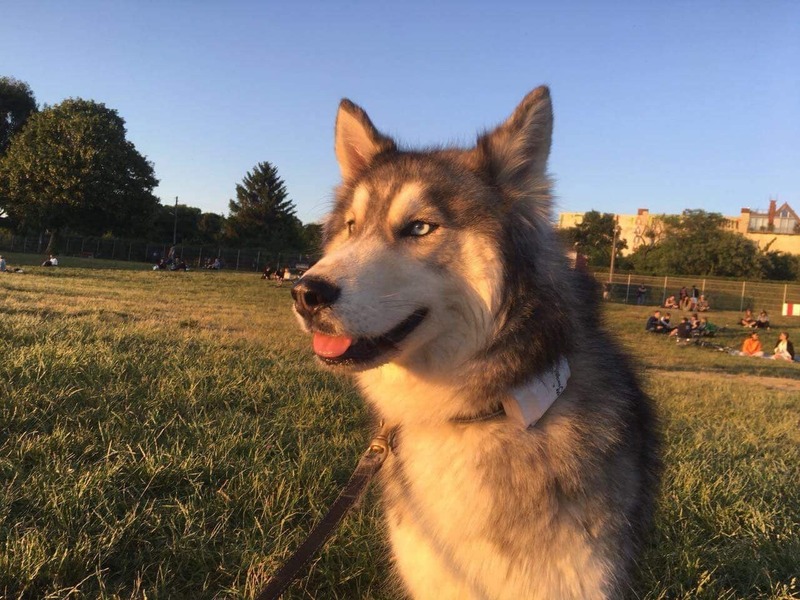 He cannot have his own dog, since his family still lives in refugee accommodation, but he’s managed to convince his parents to get one in the future once they get a flat. Fun times at Tempelhofer Feld. Source: Private. So what do you hope for the future for this project? Vanessa: I think one way the circle would really be complete for me is someday when I get a little WhatsApp text back in Vermont saying that this little boy [who’s friends with Puschkin] has moved into a flat and that his family has been able to get their own dog – I’ll turn cartwheels with joy. Ania: In this project Hania has delegated the responsibility of recruiting new volunteers to me. 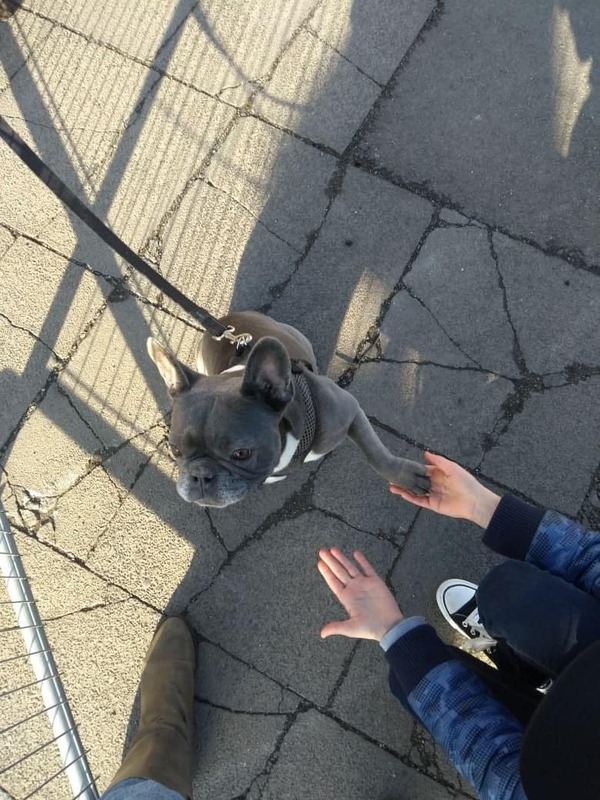 I have been organising individual meetings with each new person and the dog – it’s not very professional or anything, but of course we highlight that the dog has to be non-aggressive, calm and kid-friendly. I would just really like to keep this going on for as long as possible, so if you know anyone who has a nice, friendly dog, they can contact me! If you have a dog and want to support this project, you can contact the Open Art Shelter. Abeera Atif is Give Something Back to Berlin’s communications assistant. GSBTB partenered up with Joshua Coombes for a night dedicated to art, conversation and social causes.